In a busy church, it easy to stay on top of all the changes being made to the data in your various modules by users. With My ChurchSuite, church members can also keep their own personal information up to date. Here are ways to help you stay on top of the changes made by your church members and users to their data. The Date Added report is helpful for seeing which user created a person in the Address Book and Children modules. 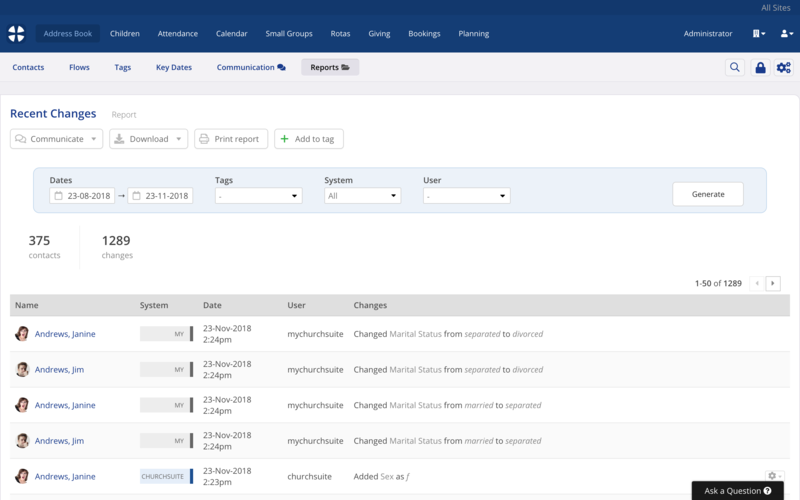 Within the Bookings modules there's a Date Added report for bookings and customers. Within the Calendar module the report is called Added Events. When viewing any contact, child, giver or customer profile page, you'll find a Changes log located in the Recent Activity section at the bottom of the person's profile page within the respective module. 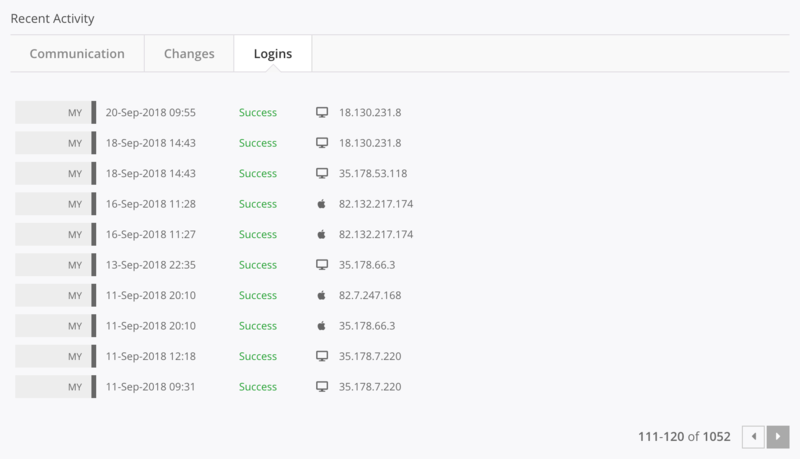 The Changes log indicates which platform the change was made in - ChurchSuite, Connect, Embed, Donate or My ChurchSuite - and the date, time and person that made the change. The details of the change is listed too, often with the option to Undo a change if a mistake has been made (which will add a further changes log!). Changes made by church members themselves will show as changed in "MY". Note that it is not possible to undo changes made by church members from within My ChurchSuite. A Created date/time stamp is visible in the very bottom left corner of each page, enabling you to see when the data was first added to a module, by whom and also how they were added. Similarly, when "editing" a person/record in ChurchSuite, the Last edited details are visible in the top right corner of the page within the respective module (see "Last edited" on the right-hand side of the grey bar in the example below). The Recent Changes report lets you view a list of all the changes that have recently been made by users in ChurchSuite or by church members in My ChurchSuite, Donate, Embed or Connect. Most modules have a Recent Changes report in the reports section, so you can easily report on changes to contacts, children, bookings, customers, small groups, small group members, rotas, givers, donations, pledges and users. To access the Recent Changes report, head the the appropriate module's Reports section. In this example, we're in the Address Book. In the report, you can filter within a range of Dates and for changes made to just certain contacts in Tag(s). You can also filter by the System the changes were made in, and by the User that made changes. Click Generate to refresh the report. You can change the report's order by clicking the column headings to order the results by a particular column. The Recent Logins report lets you see a list of contacts who have recently logged in to My ChurchSuite. Go to "Address Book" > "Reports" and choose the "Recent Logins" report from the My ChurchSuite section. You can filter a range of Dates and Tags. Click Generate to refresh the report following changes to the filters. 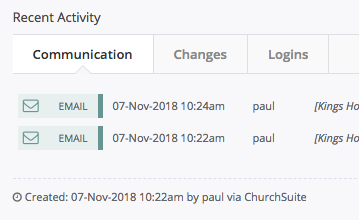 Recent Logins to My ChurchSuite by each church members are also viewable in the Recent Activity > Logins section on each contact's profile page. We've produced a separate support article outlining the various Deleted reports, which are provided in most modules to help you identify which data has been deleted from a module, when and by whom - see the related articles below for further information.